Deepak Jain is the founder and CEO of Swych. Started in late 2015, Swych is the world’s first global gifting network allowing consumers and enterprises to send monetary gifts that can be redeemed for millions of products across 250+ retailers in 5 countries. Under Deepak’s leadership, Swych has quickly grown from an idea to a global leader with 40 employees (in the US, Canada and India) and more than 1000% YOY growth in revenue. Swych has won numerous awards for its product offering and innovation at several leading industry events. Deepak is a strategic leader with more than 22 years total experience and several successful exits in the Fintech space. His passion is leading technology startups that specialize in bringing innovative ideas to market and scaling them into a global business, especially in the mobile and Fintech space. He holds over 55 granted patents and an additional 50 pending patents in payment and security technologies. Prior to Swych, Deepak founded DeviceFidelity, Inc., and served as its CEO. 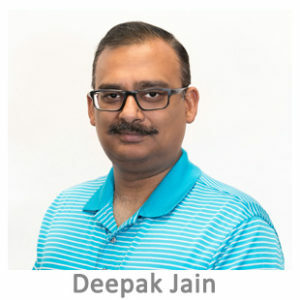 Under Deepak’s leadership, DeviceFidelity pioneered the world’s first mobile payment system-on-a-chip module to convert smartphones into smart cryptographic transaction devices. DeviceFidelity’s platform was certified by Visa, MasterCard, American Express and Discover and was deployed in over 30 countries. For his leadership role at DeviceFidelity and its transformational technology, Deepak was named a finalist for the Ernst & Young Entrepreneur of the Year in 2012. DeviceFidelity merged with Kili in 2014 which became part of Square in 2015. Deepak has a strong interest in the Fintech, payments, blockchain, IOT and artificial intelligence space where he is a frequent speaker at industry conferences and an active angel investor and mentor to other startups.